Not too long ago, I posted this blog entry on my favorite kid toys. I have a total obsession with my children’s toys, however, play time with your child goes beyond having every toy from Babies “R” Us in their playroom. Play is very important for every baby’s health and development. Play is how babies and children learn. It also provides important bonding time between child and mommy. In a clinical research study released by the American Academy of Pediatrics, play is so valued that it is considered to be a ‘right’ of every baby and child. In the fast paced society we live in where everyone is go-go-go it is important to realize how crucial it is to stop and play with your baby. Darah has been in occupational, physical, speech, and play therapy since she was a newborn, and I have really had some amazing one-on-one training on how to play with her because of those therapies. Before Darah was born, I didn’t really know how to have quality playtime with a baby and didn’t know the importance of play for the baby’s development. Since Connor has joined our family, I really feel that I know how to make the most of my one-on-one time with him and Darah. Through my experience, and countless therapy sessions I’ve observed with pediatric therapists, I have learned a few key things I’d like to share with you all. Challenge your child, but make sure they have success. A big mistake a lot of parents make is doing everything for their babies. Try to let your child figure things out on his or her own before you step in. However, if they start getting frustrated or start giving up, then step in and guide or help your child accomplish their goal. Make sure you celebrate their success. It’s important for children to have the opportunity to figure things out on their own, but it’s equally important that they be successful often. If they are never successful, they will give up trying. Finding the perfect balance as a parent, will reap you and your child many rewards! One of the biggest problems I have is just stopping whatever I’m doing and engaging into play. I have a laundry list of tasks that I like to accomplish every day. Since Darah and Connor have started playing together, I have eased up on my “get-on-the-floor” time with them, and I have really had to make a conscientious effort to make play time a priority for myself. I’m a go-go-go, Type A, busy-magnet kind of person and it really requires mental energy for me to remember to SLOW DOWN and to remember that play-time with my children is just as important as bathing, diaper-changing, etc. This is an easy one for me, but if I had Connor first I think it would be a lot harder for me. With Darah, I was forced to appreciate the smallest steps of her developmental progress. This has helped me to really appreciate every aspect of Connor’s development as well. What most moms don’t even realize is a developmental milestone, I have been able to recognize in both of my children. When you get discouraged that your child isn’t crawling or talking yet, try to look for the steps they’re taking to get there. If your child isn’t crawling, time how long they can hold themselves in the quadruped position, or help them transition from sitting into the crawling position or guide their little body with your hands and ‘make’ them go through mommy-assisted crawling. Most importantly, try to recognize what your child is doing, and be excited about it! Don’t overwhelm your child with too many choices. American babies have an abundance of toys, books, and ‘gear.’ Don’t present every single toy your child owns to him or her at one time. My kids usually play downstairs, and I keep a limited amount of toys that are freely available to them. I have found that when we go upstairs to the playroom, they both have a problem sitting down and playing with a toy, because we have SO MANY TOYS! When the choices are limited (and routinely rotated), your baby will engage more in their play-time. Play with toys in unconventional ways. If your child wants to put the puzzle piece on their face, make that a game of Peek-a-Boo. If they want to stack the shapes instead of place them in shape-sorter, work on stacking. Allowing your child to lead their play-time sessions with you will be much more rewarding and your child will stay engaged! If you’re looking for conventional games, check out this link. Talk and sing a lot to your child during play. By singing and talking to your baby during play, you are not only helping to develop their speech and language skills, but you are also sending the message that you want to be there to your baby. Your child’s vocabulary is directly related to the amount of words you speak to your child. This article discusses the importance of music for babies and here the author has a list of songs you can sing and the guitar chords! Playing with your baby does not have to be a chore. It can be fun for you. With who else would you sing all the New Kids on the Block songs into your hairbrush or dance the salsa with the broom? Your baby will know whether you are enjoying yourself or “fulfilling an obligation.” Play time isn’t only for your baby, play time can be for you as well! I was just talking to husband about this last night. Having a third baby with an easy temperment means that it is easy to put him in the exersaucer while I get some stuff done. Because he is so laid back and doesn’t complain much if I am not careful I can let the toys do the entertaining instead of giving him the special attention he needs. I was reminded at a meeting I was at last night that babies develop how to feel love their first nine months of life–especially by being held. I don’t want my third child to miss out on all the cuddles even though there is more stuff to do (than time to do it!). On the plus side, Graham is so fun to play with. He is so fun to hang out and he loves playing little games with the family. Who knew that playing with babies would be worth all the sleep loss! I must say the I have some of the most fun when I am playing with Brielle. I try ad become a kid again my self and in the process she has more fun and at the end of the day I am always in a better mood and a lighter mood. There is something so special that happens when you bond with your children in that way. I know it is something that will bonds us deeper as she gets older. So PLAY ON!! I know we’re talking mostly about playing with babies, but since some of us have older kids, what do you do when your toddler/ preschooler goes through the “obsession” phase? Like my son, for instance, has been on a musical instrument kick for the past several weeks and that’s ALL HE WANTS TO DO. The water bottle is his bassoon, the electric heaters are baritones and tubas, and one of our cords for our computer has become the french horn. Now I love music, and instruments, but all the time? No thank you! How do you divert him to play something else? How long will this last? I am tired of playing musical instruments!!! @Sharon! BOY OH BOY do I know what you’re talking about! We deal with this all the time with my 3 year old….I’m going to follow up to your comment with a blog entry! 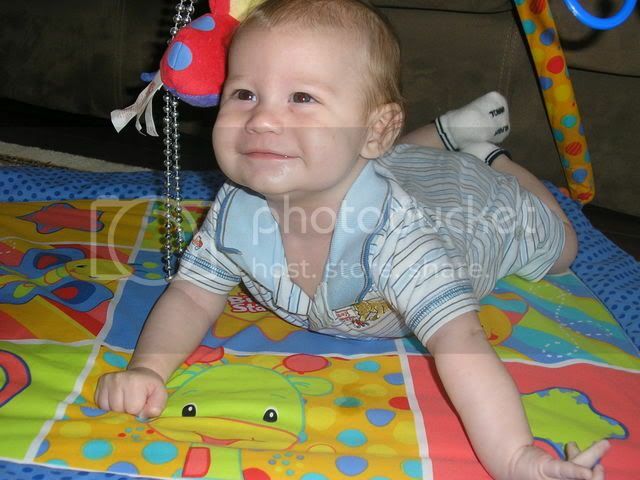 Motor skill activity helps brain development for babies and teaches them the joy of movement! Warm up your child's night with an organic cotton sleepwear.